When an object, such as the book, is brought within several inches of the eye, rays of light from this object diverge, are converged by the cornea and the natural crystalline lens in an attempt to focus on the retina. To allow this to happen, the human lens will accommodate, i.e. become thicker centrally and optically more powerful causing further bending of the rays of light until they focus on the retina. Thin fibers, called zonules, attach the lens to a circular muscle called the ciliary muscle. As long as the zonules are taut, the accommodative reflex will work; the ciliary muscle contracts, shortening the zonules. The elastic fibers of the lens can now retract permitting the lens to thicken, increasing its power and allowing you to read. 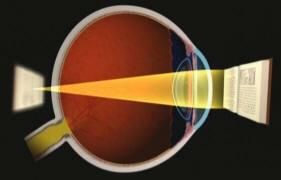 This is the status of the lens before the accommodative reflex is activated. This is the status of the lens after the accommodative reflex has been triggered. Note that the center of the lens has thickened. Accommodation is a naturally occurring reflex which works fine until the mid 40's when, unfortunately, reading glasses are required to achieve this,. The diminished capability of the crystalline lens, by continually increasing in length as it ages, is believed to be related to the way the lens is supported by the zonules. At some point, the lens has grown so large that these zonules are no longer taut, preventing the accommodative reflex from occurring.